As always, there is a lot going on and not enough time to talk about it all. I hope you don’t mind, but I’m going to keep this very brief because . 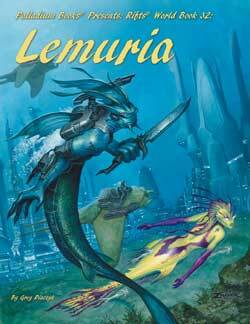 . . Rifts® Lemuria is in final production! And we want to keep working on it. - As I write this, Wayne has begun typesetting and we’ve discussed the layout of Rifts® Lemuria. - I’m done with the rewrites and additions, except for two final sections: Biomancy War Steeds and Sea Serpents/Sea Monsters, and maybe a few final tweaks to O.C.C.s. - Page count is almost certain to go to 224 pages and there will be no price increase. Yes, I know fans love big books, so be happy. For us, they are a mixed blessing. They are more costly in art, printing, shipping and in time to create (for example, we have spent at least two weeks longer doing more work on Lemuria and expanding the page count). So why do it? a) Because I’m an idiot. b) Because some books, like this one, deserve it. c) Because I cannot bring myself to not make these books epic and something special. Much of the material and ideas were just too darn good to cut out. Heck, I’ve trimmed some concepts and material to squeeze it all into 224 pages. End result: Rifts® Lemuria is awesome. Personally, I think it’s on par with Rifts® World Book 2: Atlantis. - To the printer by Monday. All of us will work through the weekend to get it laid out, proofread and to the printer. It should go in first thing Monday morning. Should ship 2-3 weeks later. Megaverse Insider hardcovers and PDFs 2-5 weeks after that. So keep those pre-orders coming (the softcover ships out the day the book arrives in the warehouse), and snag a few other items, like the new set of bookmarks, while you’re at it. - Check out this week’s Murmurs from the Megaverse® for other details about the goings-on at Palladium and to read a couple of small Rifts® Lemuria “teasers.” I’ve tried to be on Facebook a lot this week, too. 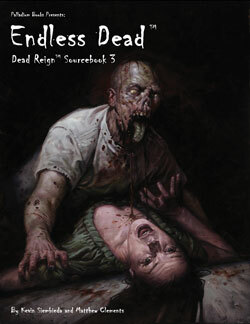 Dead Reign™ Sourcebook 3: Endless Dead™ and The Rifter® #58 are what Wayne and I dive into next. Both books will be April releases. 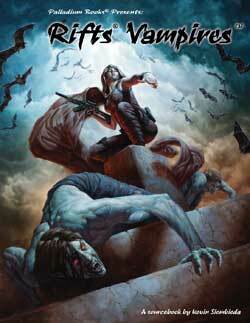 With any luck, the Rifts® Vampires Sourcebook will also be an April Release. We are primed to get these three titles out fast. Then it’s the Palladium Open House (May 4-6). And then it’s back to banging out one new, hot release after another. Online sales took a terrible tumble and stayed flat all week. As I said in a Murmur, I can’t say as I can blame anyone but ourselves. You’ve been waiting for new books to buy for months. And we’re hard at work to make that happen and soon, so please snap up the new releases coming out in April as fast as you can. Thanks. Keep the feedback coming. We have gotten an excellent response to our poll about doing Megaverse® Insider crowdsource funding offers. Please keep the voting and feedback coming. We want to know what YOU think and want, because you are appreciated. Click here to vote in the poll. Palladium Bookmarks, Set Two is available now. The new bookmarks arrived Wednesday and look every bit as good as Set One. They feature Chaos Earth™, Phase World®, Nightbane® and Beyond the Supernatural™. The entire set is only $5. See the description elsewhere in this Weekly Update. UPDATE: Sneak Previews on DriveThruRPG.comDriveThruRPG.com for Rifts® Lemuria will go up sometime early next week. Till then I’ve been posting a few small “teasers” in some of my Murmurs from the Megaverse®. The sneak preview for Endless Dead will quickly follow after it. Don’t forget, there are 90+ backstock titles, including back issues of The Rifter®, first edition rule books, other sneak previews and the Rifts® Game Master Kit, all available as PDF downloads at reasonable prices. Reminder: Gaming at the Westland Library – March 31, 2012 – Saturday from 1-4 PM. This the next library event where Julius and I will be running games. We are already seeing more interest from local gamers so this could turn into something big. Join the fun and this is a great way to introduce a new generation to Palladium role-playing games or to give our games a try. PLEASE REGISTER with the library early, so we can make sure we have enough Game Masters to accommodate everybody who wants to play. Sign up by calling the library at (734) 326-6123 or online at http://www.westlandlibrary.org/node/3089. The gaming is from 1-4 PM, Saturday, March 31, 2012. The library is located on Central City Parkway between Ford Road and Warren. Palladium Open House is only 7 weeks away!! We’ll be ready to rock your world all weekend long with Palladium gaming events. We still need more G.M.s to send us their event information!! If you have any questions and Wayne isn’t getting back to you, contact Alex or call the office. We need games! Sorry about all those exclamation points, but the POH will be here in no time. And we need gamers in and around Michigan to join the fun! Take this opportunity to game with the guys and gals who make the games you love. Palladium Open House Hotel Rooms are going fast! Reserve your hotel rooms as soon as you can. Your credit card does not get charged till the day of the event and you can cancel up to a week before. The hotel is inexpensive and excellent ($69.95 for two double beds or one king) and there will be two conference rooms (one small, one large) for all-night gaming at the hotel. NOTE: It helps Palladium if you reserve your hotel room BEFORE March 31. Thanks. UPDATE: Kevin’s Online Toy & Collectibles Store. Alex and I have been adding some Palladium collectibles and new toys and action figures to my online store. We’ll try to add more new items next week as well. Right now they include Palladium gold editions, some artwork, art prints, The Rifter® #20, and various out of print books – most of it signed. We’ll keep them coming if you keep buying them. Other stuff. All kinds of other stuff continues, from research and development of Rifts® and Robotech® Miniatures, The Rifter #0.1 and #0.2 (digital editions), reprinting books, exploring other opportunities, and prepping for the Palladium Open House, which is coming up fast. Rifts® World Book 32: Lemuria – New – in final layout. 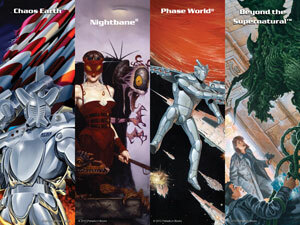 A set of four, 2 x 6 inch bookmarks, each depicting a different Palladium game line: Chaos Earth™, Phase World®, Nightbane® and Beyond the Supernatural™. They are attractive, useful and make a fun collectible. The first set has been so popular, we had to do a second. 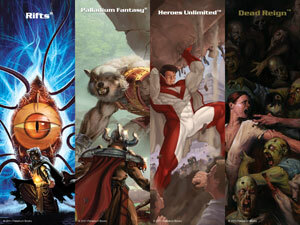 Art by Scott Johnson (Rifts® Chaos Earth™ Glitter Boy cover), Kevin Long (Phase World® Sourcebook cover), Brom (Nightbane®), and John Zeleznik (Beyond the Supernatural™). Cat. No. 2555 – $5.00 retail. Based on what similar bookmarks sell for, we figure the set of four should have an $8.00 value, but Palladium’s price is only $5.00. Cat. No. 2554 – $5.00 retail. Based on what similar bookmarks sell for, we figure the set of four should have an $8.00 value, but Palladium’s price is only $5.00. This popular, fan-favorite Phase World® sourcebook presents a dynamic overview of the Anvil Galaxy™ and its many alien races, technologies, conflicts and secrets. A great resource for any Phase World® fan and valuable addition for campaigns involving the Minion War™. Legends of the Cosmic Forge™ and the Forge War™. 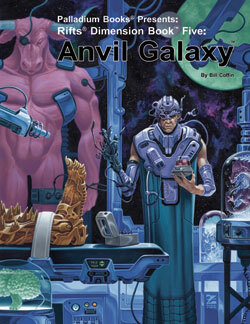 Nearly 20 alien races and an overview of the Anvil Galaxy™. Transgalactic Empire and Consortium of Civilized Worlds. Overview of the Three Galaxies. 160 pages – $20.95 retail – Cat. No. 847. Available now. 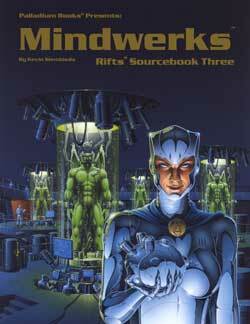 Rifts® Mindwerks™ is a companion to Triax & The NGR™ and Triax™ 2. It details the techno-horrors of the Mindwerks Corporation and its insane mastermind, the Angel of Death, as well as providing more information on the NGR, the Gargoyle and Brodkil Empires, robots and equipment, plus the Gene-Splicers, a dozen D-Bee races, an evil Millennium Tree, mind-altering cybernetic implants and a few notable kingdoms. 14 O.C.C.s and R.C.C.s, including the Lycanmorph and Null Psyborg. Mindwerks ‘bots, cyborgs, weapons & equipment. Mindwerks M.O.M. conversions, Crazies and insanity. Gene-Splicers and their presence on Rifts® Earth. Germany’s infamous Black Forest and its evil Millenium Tree. Massive new war machines for the Gargoyles and the NGR. The Kingdom of Tarnow, its namesake magical crystal and anti-Gargoyle weapons and equipment. More information on Europe after the Coming of the Rifts®. 112 pages – $16.95 retail – Cat. No. 812. Available now. 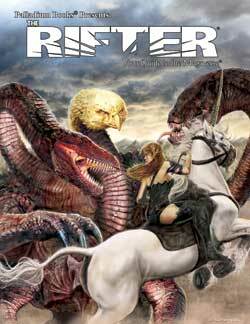 The Rifter® #57 is an extravaganza of monsters and mayhem to surprise your players and spice up your games. Rifts® Lemuria – sneak preview. Rifts® – new weapons and vehicles of the Coalition States. Beyond the Supernatural™ – 5 new monsters and supernatural threats. Palladium Fantasy® – 20 monsters and dangerous animals galore. For all game settings – Genie bottles and dimensional pockets. Rifts® – The Brodkil War Machinist O.C.C. Rifts® – NGR Anthropological Field Operative O.C.C. News, coming attractions, and more. Cover by Charles Walton II. 96 pages – still only $11.95 retail – Cat. No. 157. Available now. 8 expansive new O.C.C.s including the Serpent Hunter, Spouters, Oceanic Guardsman, Biomancer Gene-Mage, Birdmen and others. 20+ exotic animals sea serpents, Sea Dragons and riding animals. 50+ new Biomancy spells and some new Ocean Magic spells. Nearly a dozen types of living Bio-Armor (Lemurian power armor). Stone vehicles and weird weapons and devices. Interior art by Chuck Walton, Mike Mumah, Brian and Allen Manning, Kent Burles, Nick Bradshaw and Amy Ashbaugh. 192-224 pages (probably the latter) – $24.95 retail – Cat. No. 885. End of March release. Endless Dead says it all. The zombie hordes grow in number and strangeness. Can humankind survive? Where is the military? What’s next for the survivors of the zombie apocalypse? This book contains horrifying new zombies to haunt your player characters along with new O.C.C.s and tons of tables for detailing Survivors’ Hideouts, Safe Haven Communities, Death Cults and more. Survival is not enough. Now is the time for the war against the Endless Dead™. This book is epic. New types of zombies include the Fused Zombie, Multi-Zombie, Parasite Juggernaut and Walking Mass Grave. New O.C.C.s include the Wheelman, Zombie Hunter, Zombie Researcher, Survivalist and Watcher. Information on vehicles and tables for adding custom armor, weapons and anti-zombie defenses. 96 pages $16.95 retail – Cat. No. 233. April release. $16.95 – 128 pages. Cat. No. 884. April release. Full 109 P.A. catalog of Northern Gun products! 160 pages – $20.95 retail – Cat. No. 887. May release. 96 pages – $16.95 retail – Cat. No. 555. May release. 192 pages – $24.95 retail – Cat. No. 876. June release.